This Website Is No Longer Active. : Someone Must Be Shitting Themselves ! Having just returned home from a short time away I was amused to find that a recent article that I had published had been removed from this site by the owners of blogger and the following message inserted in it's place. The article in question referred to the new business enterprise being undertaken by one Julie Rzezniczek the disgraced former Head of Children's Services of Neath Port Talbot County Borough Council and kidnapper of Linda's daughter N@t@sh@. Obviously someone is upset at the article that was read by hundreds of people worldwide and attracted 23 comments. Obviously someone may think that I have breached Miss Rzezniczek's rights by posting details of her new business venture, her place of business, her email address and her contact telephone number on this blog even though it is freely available to anyone who wishes to do a simple " GOOGLE SEARCH." So someone thinks that Julie Rzezniczek has rights ! Well my question to Julie Rzezniczek is this. What rights did you ever give to Linda or N@t@sh@ ? 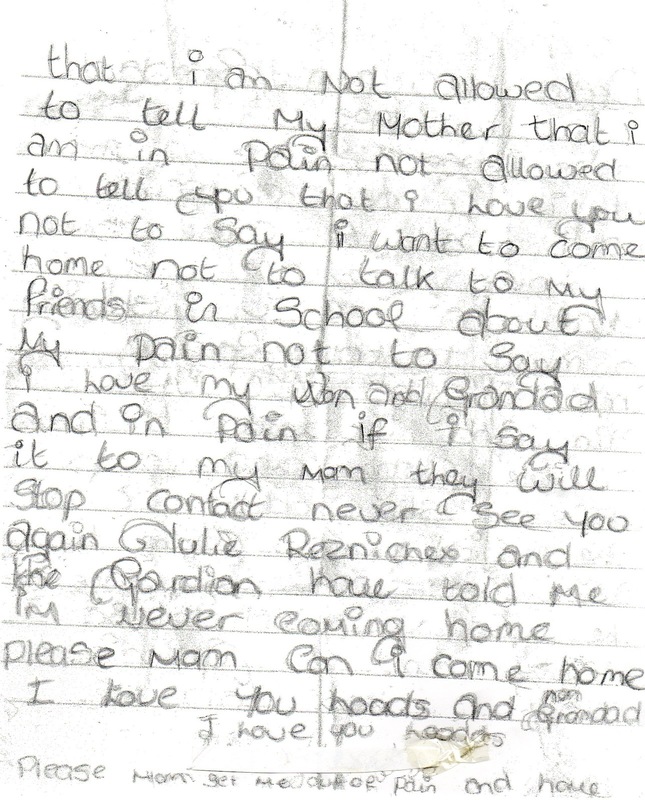 Please read again the following letter ( one of many ) that N@t@sh@ smuggled out to her mother while you were keeping her as a prisoner against her will at the tender age of 12 years old. Could you also explain to myself as you can clearly see at the bottom of the letter that N@t@sh@ clearly deeply distraught writes.
" Julie Rzezniczek and the Guardian have told me I'm never coming please mam Can I come home I love you loads and nan and Grandad." I would also like to point out to you Miss Rzezniczek that at the time that this letter was smuggled out and received NO DATES had ever been set for any sort of court hearing to decide the outcome of N@t@sh@'s custody and future placement ! 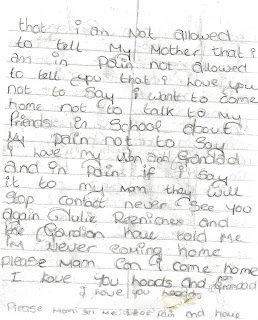 SO HOW COULD YOU TELL A 12 YEAR OLD CHILD THAT SHE WAS NEVER COMING HOME ? Everything about this case is unlawful and illegal and you have played the prime role in the kidnapping and abuse of this child and the continued cover up. One day you will be in jail. Good man Kev I don't need to say keep up the good work as I know you will anyway. The only reason the article was removed.Because You have hit a nerve by telling the the truth. Isn't it a disgrace to think! Rzencheck is still aloud to work with vunerable Child. It is blatent by the Childs letter she did not listen to her wishes and views. "Bully Tatics" definiteley a human Rights issue. Without People like yourself exposing those who abuse their power.The public would'nt have a clue what's going on. Just goes to show how scared they must be to have the post removed. Julie Rzezniczek should be made accountable for her actions. I bet she is more than shitting herself.I admire the way you have fought for the Child and Family. !. Why ask for the article to be taken down. 2.Who has been affected by the article. The only reason why the article was ceased, because the "guilty" did not want the truth out. Julie Rzezniczek should be on Trial.I'm sure the family will get Justice when there are people like you fighting for them. what about Freedom of Speech. The government should hold a Public inquiry into the way Julie Rzezniczek has abused her position. You have given me some inspiration,knowing there are still men in this Country. surley she should be Stopped! I agree with one of the comments Julie Rzezniczek is guilty! and she dosen't want anyone to know what she has done to the poor Child. I hope Julie Rzezniczek goes to Jail for kidnapping a innocent kid. what i want to know why haven't she been arrested. And how many more kids have suffered abuse by this woman. The only reason the Post was taken down was to protect Julie Rzezniczek from the crimes she's comitted. At least Kevin got the balls to expose her for what she's done. i read the child's letter evil witch. Don't worry what goes around come's around. Are these people above the Law. Heartfelt sympathy for the child read her letter,don't know what i would do if it was my child.Surley heads should roll for the way this child suffered. These people who are paid to protect our children. You have published some of the evidence,which proves the scale of corruption. the link does not seem to show who made the request or the specific reasons - maybe if its there and not obvious perhaps you can cut and paste onto this page - do you or anyone know who asked and the reason?? otherwise anyone can secretly write to a blog host and ask them to restrict anything - which is not freedom of speech? Don't they understand this case is NOT! going to STOP! until someone is made accountable. What an earth is going on why? is this person working with children is beyond me. I agree with the comment this should go Worldwide. I must say you have handled the Justice For Linda Lewis case with professinalism and dignity. The family are decent respectable people this should never have occured. It's Frightening what these so called professinals will do to cover-up their crimes. What we are up against here is some deranged, twisted and extremely sick individuals. Their time is getting shorter by the day. Where and when is the next Britain First meeting? There will be a meeting in the next couple of months. Watch this space. Dreadful I'm amazed no-one has been proscuted. KEV all my blogs have been removed. Did you know this?